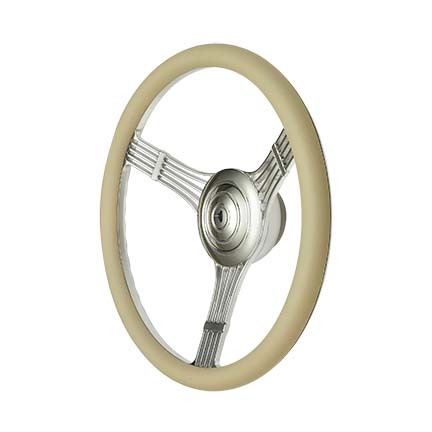 Shown with Model: 11-1220 horn button and Model: 10-5506 hub (both sold separately). One piece forged 6061 Billet aluminum construction. Polished (front back and edges). Tan leather top grip with billet finger grips. Grip can be removed and custom wrapped to match your vehicle interior perfectly. Horn buttons (sold separately) install flush in wheel and is secured with an O-ring design to ensure they do not "pop-off" in the middle of the night! 9-bolt mounting pattern, can be used with any GT9 installation hubs and GT3 horn buttons. This 9-bolt mounting pattern is interchangeable with any standard 9-bolt hub or horn button. Diameter: 15.5" Dish: 1 3/4"
Click the image below to see our selection of GT9 Horn Buttons. To find the correct installation hub, click on the GT9 Application Guide. Designed to fit our GT9 Installation Hub & GT9 Horn Button. 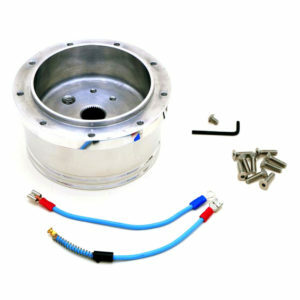 Interchangeable with any standard 9-bolt hub or horn button.